Maurice Ravel was ever drawn to the pictorial and theatrical possibilities of music, indeed a good many of his works were prompted by extra-musical influences, ranging from Greek legends to children’s stories. A meticulous composer and detailed, sophisticated orchestrator, Ravel was often painstakingly slow in completing his orchestral compositions. The results, however, were always well worth the wait—producing some of the finest, most intricately orchestrated jewels of the repertoire. The ballet, Daphnis et Chloé, for example, occupied Ravel between 1909, when first commissioned by Sergei Diaghilev for his company, the Ballets Russes, until the middle of 1912. As a measure of Ravel’s thoroughness, during the same time period, Diaghilev commissioned and produced two Stravinsky ballets, The Firebird and Petrushka, with the young Russian composer already finishing a third, the infamous Rite of Spring by the time Daphnis was performed. However, Ravel’s work ethic prevailed and most of his output, unlike that of many of his contemporaries, remains solidly in the repertoire the world over. Of all my parents’ friends I had a predilection for Ravel, because he used to tell me stories that I loved. I used to climb on his knee and indefatigably he would begin ‘Once upon a time …’ And it was Laideronnette, Beauty and the Beast and, above all, the adventures of a poor mouse … Between 1906 and 1908 we used to have long holidays at my parents’ house in the country … It was there that Ravel finished, or at least brought us, Ma mère l’oye. But neither I nor my brother was of an age to appreciate such a dedication and we regarded it as something entailing hard work. Ravel wanted us to give the first performance, but the idea filled me with cold terror. Ravel was a tremendous pianist and perhaps his enthusiasm had rather won over the practicalities of such young, and clearly not overly keen children giving a world premiere. Although he took pains to make sure that young hands would be able to cope with the pianistic demands of the Suite, Mimie and Jean did not give the premiere, and the duty was duly taken over by two more confident and competent children, Jeanne Leleu and Geneviève Durony, in April 1910. The following year, at the behest of his publisher Durand, Ravel orchestrated the suite and this eventually led to the idea of the work being extended into a ballet. The original orchestral version, performed here, presents the suite as it was originally intended, as five short, beguilingly crystalline visions of childhood. The literary sources of the suite stem from the delightful stories of Charles Perrault and Countess Marie d’Aulnoy, remarkable individuals who both can lay claim as founders of the modern fairy tale. The first piece ‘The Sleeping Beauty’s Pavane’ is as brief as it is thoughtful and dreamlike, evoking the sleeping princess watched over by the good fairy. ‘Petit Poucet’ depicts Tom Thumb, his haphazard route through the forest portrayed by the oboe, sprinkling breadcrumbs behind him as he wanders into the dangers of the forest, while the birds sneak up behind him, tweeting their joy at the unexpected snack. ‘Laideronnette, Empress of the Pagodas’, conjures up the princess, disfigured by a horrid witch’s spell. She meets the similarly blighted green dragon, and together they venture forth, encountering animated pagodas which sing and perform for the pair, Ravel conjuring up an oriental, pentatonic world beautifully in the percussion section. ‘Conversations of Beauty and the Beast’, the most famous movement of the suite, sees this unlikely couple represented by high and low woodwinds, respectively. With the clash of cymbals, the beast transforms once again into a prince, and they pair off as a solo violin and cello to lovingly end the waltz. ‘The Fairy Garden’ concludes the work with the charming prince awakening the sleeping beauty and closes this most marvellous summation of the mystery and magic of the fairy tale. Ce recueil de «5 pièces enfantines» ravit l’oreille du mélomane, tant au concert symphonique que dans les récitals de piano. 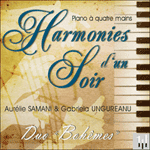 La version originale composée entre 1908-1910 à Paris fut créée le 20 avril de cette même année à la Société Musicale Indépendante, Salle Gaveau, par Jeanne Leleu et Geneviève Durony. Ravel a puisé son inspiration dans des contes de fées du 17ème siècle français, chez Charles Perrault, la comtesse d’Aulnoy et Marie Leprince de Beaumont. Il précisa: «Le dessein d’évoquer dans ces pièces la poésie de l’enfance m’a naturellement conduit à simplifier ma manière et à dépouiller mon écriture.» C’est dans cet esprit de simplicité et d’ingénuité enfantine que l’on peut les écouter.